You have until MIDNIGHT TONIGHT to submit your entry for this year’s Royal National Mòd. Entries must be submitted online at enter.ancomunn.co.uk. We will not accept any entries via email or through the post. If you have any questions about your entries, please contact our offices on 01463 709705 or 01851 703487. Our offices are open until 5pm. Schoolchildren from across Glasgow have today (Friday 23 June) joined together for the grand unveiling of the logo for the Royal National Mòd 2019. Glasgow will host An Comunn Gàidhealach’s Royal National Mòd in 2019 – the first time it has been held in the city for 29 years - and the logo has been developed to show a modern and vibrant face for the week-long festival of Gaelic language, music and culture. The ambition of the local organising committee of Mòd Ghlaschu 2019, along with the support of Glasgow City Council and Glasgow Life, is to help An Comunn Gàidhealach deliver a Mòd that is ambitious and forward-looking whilst respecting the traditions of the Mòd and its cultural roots. Leading Glasgow-based design agency The Creative Cell (An Còmhlan Cruthachail) has worked closely with the local organising committee to develop a logo that will work in print and across social media and it is hoped the fresh new look will increase awareness amongst both Gaelic and non-Gaelic speakers and generate engagement from participants, volunteers and spectators. The 2019 festival will continue to offer a range of competitions for both children and adults – in oral, singing and instrumental performance. The Highland Dancing and Piping competitions may also find a new place within the festival to allow for the full breadth of talent to be showcased. 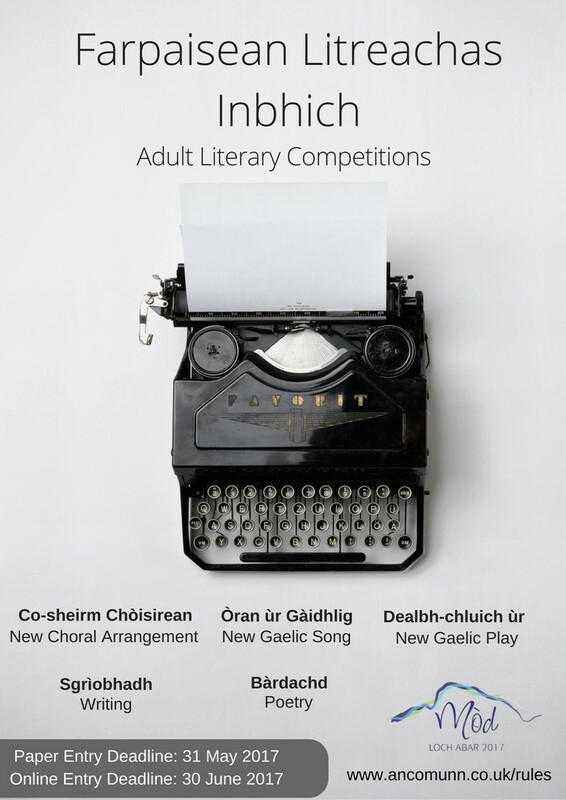 In addition to the competitions, there will be an eclectic Fringe programme that will showcase some of Scotland’s finest musical talents in the run-up to and during the Mòd week, and providing entertainment from some of Gaeldom’s premiere performers. Donald Iain Brown, chair of Mòd Ghlaschu 2019, said: “When Glasgow won the bid to host the Mòd 2019 we knew then that we had to create a vibrant brand to take the festival forward and to present an inclusive and welcoming message for the people of Glasgow that Gaelic culture is here to be embraced by all, regardless if they speak Gaelic or not. Councillor David McDonald, deputy leader of Glasgow City Council and board member of Glasgow Life, said: “The city’s relationship with An Comunn Gàidhealach stretches back over 120 years since the Mòd’s inception in 1891. It has been nearly 30 years since the Mòd was last held in Glasgow and today’s logo unveiling is an exciting step towards its welcome return in 2019. “Glasgow City Council is committed to supporting Gaelic development through its Gaelic Language Plan, which is at the heart of shaping and progressing our activity in education, communities, workplaces, arts, media, heritage and tourism to promote Gaelic and widen its availability. Today, for example, Glasgow is home to the largest number of pupils in Gaelic Medium Education outside the Highlands and Islands. Gaelic is deeply rooted in the City of Glasgow. Its connection with Gaelic speaking Highlanders dates back to the 15th Century, and today there is a renaissance of Gaelic in the city, with the number of children attending Gaelic Medium Education (GME) rising considerably over the last decade. By 2019, it is planned that there will be three Gaelic primary schools in Glasgow, a high school and many feeder nurseries, all supported by a well-developed Gaelic arts and engagement strategy. The Royal National Mòd 2019 competitions will take place in the Royal Concert Hall, Glasgow from Friday 11 – Saturday 19 October and will bring thousands of competitors from Scotland and across the world to the city to take part in Highland dancing, sport, literature and drama, as well as Gaelic music and song. Iomain Cholmcille, the international shinty-hurling competition for Scottish Gaelic and Irish speakers, will be held in Fort William this year, marking ten years of the most successful sporting event in Gaelic in Scotland. The event will be held as part of the Royal National Mòd, Mòd Loch Abair on the14th of October 2017 at An Aird. The competition is unique in that all the players must be fluent in Scottish Gaelic or Irish and that they must use the language on the park. This is the first term that the competition has been held as part of the Mòd in its long history. Iomain Cholmcille was first held in Oban on the 10th of June 2007 as part of the Fèill Chaluim Chille. Since then, it has been held in Connemara, Donegal, Skye and Glasgow. it has grown from one game between Alba, the Scottish Gaelic team and Micheál Breathnach GAA to take in Fir Uladh from the North of Ireland and Na Gaeil Òga from Dublin. It has also now included a competition the Gaelic speaking women of both countries, with the Còrn Sgàthaich played every year. This year, there will be a youth competition for Lochaber youngsters where they will learn Gaelic whilst playing the game of the Gael. They will also have the opportunity to learn some Hurling skills with coaching from representatives for the two competing Irish teams at An Arid in the morning. The Royal National Mòd always holds a competition for shinty every year, and this has not been neglected. The Mòd Cup for local teams will be held on the same day at another venue TBC in the area. All in all it will be a fantastic festival of shinty across Lochaber. Iomain Cholmcille receives support from Colmcille, a partnership between bòrd na Gìadhilg and Foras na Gaeilge which seeks to strengthen and develop connections between Gaelic speakign communities and individuals in Scotland and Ireland. Iomain Cholmcille will be working in partnership with An Comunn Gàidhealach, the local Mòd Committee and Fort William Shinty Club on this project.